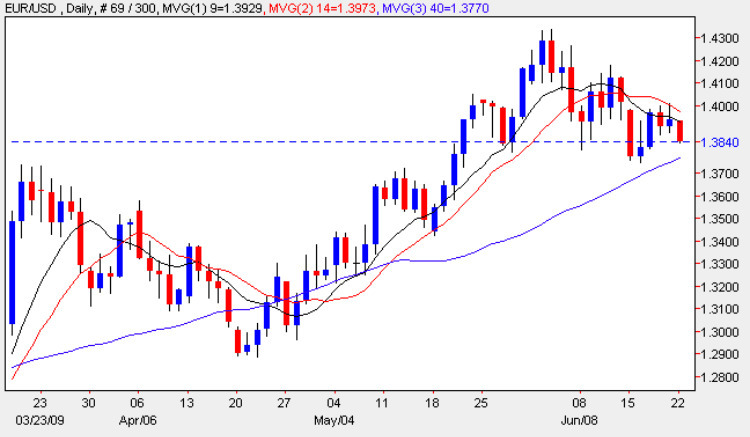 A week of sideways consolidation ended on Friday with a bearish candle which closed the session marginally higher on the day but with a deep upper wick which bounced neatly off the 14 day moving average suggesting a bearish outlook may be in prospect for the euro vs dollar. Indeed this view has been confirmed in early trading with a significant fall in this morning’s early trading session with the euro vs dollar price currently trading 1.3844. The important point to note from Friday was that, not only did the 14 day moving average add pressure to the downward move, but that once again the attempt to move higher failed to break through the neckline of the head and shoulders which remained intact throughout the week. For any longer term downward move we would need to see a break below the 40 day moving average coupled with a break through at the 1.36 price level and should these factors combine then we could see a much deeper move to re-test the 1.32 region, or even 1.29. Much will depend on the risk sentiment for investors in the wider markets and, in particular, their views of equities, the US Dollar and commodity markets. All of this may well be resolved during the week with the release of the FOMC statement, US GDP figures and the result of the Treasury Auction. My personal view is that this week will be seminal for the US Dollar and its short term direction and we may well see some extreme volatility at some point.